Home Best Jumping Media Press Release Abdullah Al Sharbatly leads the Winning Round of the Azizi Golden Cup. Abdullah Al Sharbatly leads the Winning Round of the Azizi Golden Cup. Abdullah Al Sharbatly led the Saudi Arabia rebellion in the €92,100 Azizi Golden Cup Winners Round, taking the top three places. Saving the clearing dominated in the fourth FEI class of the CSI5* FEI World Cup – Arab League – Emirates Equestrian Club Dubai by the Saudi riders, Abdullah Al Sharbatly took the victory next to 13-year-old gelding Crazy Quick (Chacco- Blue x Quick Star) owned by Jaroslaw Skrzyczynski & Izabela Dyr, with a time of 46.55 seconds. Adding 100 World Ranking Points by Abdullah Al Sharbatly, he guided the group on course designed by Robert Ellis and was escorted by the outstanding performance of his countryman Ramzy Al Duhami, who took second and third place with the 11-year-old gelding High Quality J (Quadrillo x Nabab de Reve) in 47.31 seconds in second and third was accompanied by the 10-year-old gelding Ted (Waranta x Jalisco B) in 49.28 seconds. The Belgian rider Celine Schoonbroodt – De Azevedo completed the Top 5 with the 10-year-old mare Chepetta (Chepetto x Cash) in 52.85 seconds ranked fourth and fifth Frederic David of France, finishing in 53.69 seconds his winning round with the 13-year-old stallion Baloussini (Baloubet du Rouet x Cassini I). 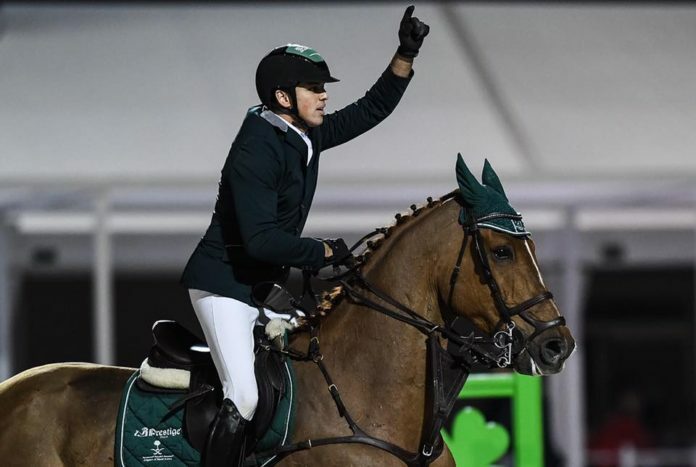 By the Latin Ranking Luiz Felipe de Azevedo Filho of Brazil managed to add World Ranking points occupying 13th place, completing the first round in 1 fault and time of 83.18 seconds with the 13-year-old gelding Chaccomo (Chacco-Blue x Contender). Previous articleKoen Vereecke commanded the Belgian one-two in the CSI2* Moorsele. Next articleLeopold van Asten wins €24,700 Seacon Logistics CSI2*.